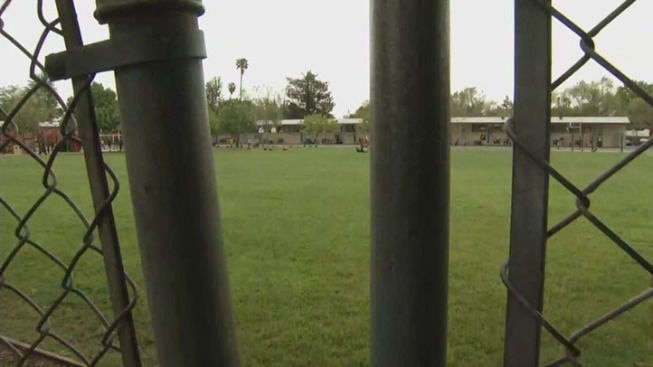 A man exposed himself to a 7-year-old girl while she was playing at a Palo Alto school on Monday afternoon, police said. The suspect allegedly exposed himself to the child from behind a fence at Ohlone Elementary School at 950 Amarillo Ave. during her lunch recess around noon, police said. Officers weren't notified of the indecent exposure until about 6:15 p.m., when the girl's parents informed dispatch after they picked up their daughter from school and she told them what happened, according to police. The girl ran to the back area of a classroom on the west edge of the school, where she made eye contact with a man who stood behind a fence off campus while he watched children play, according to police. She saw the man's pants were unbuttoned and described his actions later to investigators, who suspect he was masturbating, police said. Police do not know if other children saw the man, who never said a word to the girl. The suspect is described as a thin Hispanic man in his late 30s or early 40s, who was unshaven and had a goatee, police said. He wore a black sweatshirt, blue jeans and blue and gray tennis shoes at the time of the incident, according to police. Based on the girl's description, investigators believe the suspect was also at Palo Alto Buddhist Temple at 2751 Louis Road, which the public can access from the street and is next to the school separated by a chain-link fence, police said. Investigators are looking into whether the incident is related to other cases within the city, according to police. This is the fifth indecent exposure in Palo Alto in 13 months, police said. More patrol officers in marked and unmarked vehicles will be around elementary schools in response to Monday's indecent exposure, police said. Principal Nicki Smith has addressed the incident to school staff, teachers and parents, Palo Alto Unified School District spokesman Jorge Quintana said. Smith also called on school staff and recess aides to be extra vigilant while children are outdoors, he said. "It happened at a site next to campus but we want our students to feel safe at our school," Quitana said. Parents, who are being advised to tell their children to be alert and inform a trusted adult if they see anything suspicious, are concerned about their safety. "If someone is doing such a thing that is dangerous for the children ... there is a possibility of him [doing] other things," said Lupe Buenrostro of East Palo Alto. Anyone with information on the case is asked to call police dispatch at (650) 329-2413. Those who wish to remain anonymous may send an email to paloalto@tipnow.org or send a text message or voice mail to (650) 383-8984.